Researchers from Canada and the US have revealed new insights into the eating habits and hair-growth patterns of a wild grizzly bear population, by analysing the chemical content of their fur. The team led by Garth Mowat, the head of the Canadian government’s Natural Resource Science Section in the Kootenay region of British Columbia, was studying the dietary patterns of grizzlies around the province’s Stikine river. By examining the ratios of different isotopes of carbon, nitrogen and sulfur in the samples, the researchers could determine what proportion of vegetation, fish, or land mammals like moose and mountain goats made-up the bears’ diet. The team set up traps that could snag a few hairs from a grizzly bear’s back as it scratched itself on a tree trunk, or made its way down a trail to a feeding ground. Back in the lab, the isotopic analyses brought some unexpected results. Surprisingly, even during the peak of the salmon season many bears shun the river, choosing instead to continue foraging for vegetation. ‘That was the most intriguing result to us. 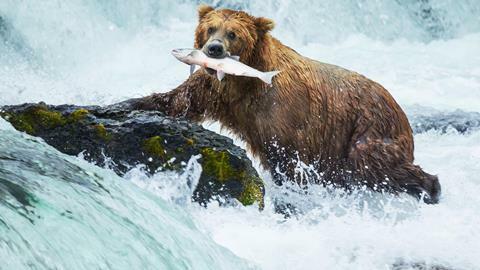 We thought that any bear that lives within walking distance of the salmon stream would go down and eat some salmon,’ says Mowat. 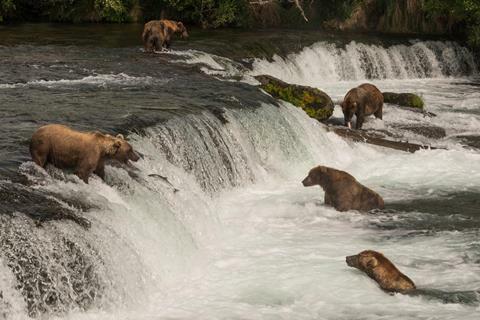 While some female bears with cubs, and smaller males, might avoid the salmon streams to duck confrontation with aggressive larger males, Mowat points out that in other coastal regions, smaller bears still manage to eat salmon from very young ages. Throughout the year, bears’ diets shift from protein-rich to fattier foodstuffs, as they build up their fat reserves for the winter. Because carbon-13 is often depleted in fatty tissues, this complicated the researchers task, as they would observe significant variation in isotope patterns among hairs from individual bears. ‘Once they have satisfied their protein needs, they will start focusing on the parts of the animal that are high in fat, because transferring fat to fat – fish fat to bear fat – is the most efficient chemical pathway,’ says Mowat. 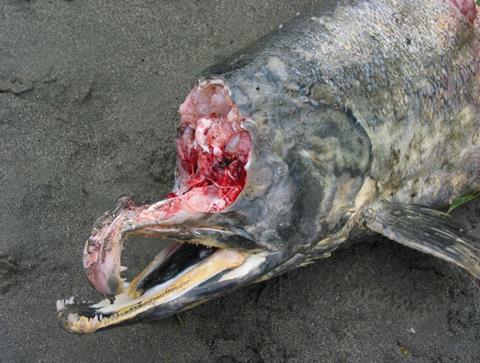 ‘[A salmon’s] brain is mostly fat, so they break the skull open and eat the brain. The roe is high in fat, and then the skin, even though it doesn’t seem very good to eat to us, is largely fat.’ These selective eating habits meant that Mowat’s team would often come across gruesome scenes of skinned and decapitated salmon carcasses strewn across the banks of the river. They also found that the wild bears’ hair grew later in the year than previously thought. Previously, it was believed that the region’s grizzly bears started growing their thicker winter coats from May or June. However, the presence of the isotopic signature of salmon consumption in longer hair samples showed that in fact the bears started to grow their thicker coats later in the summer, as it would not be possible for this signature to appear before the salmon had returned to the Stikine. This finding has important implications for other researchers who want to study bear behaviour by analysing their hair. Jeff Curtis, an environmental scientist from the University of British Colombia, whose lab ran much of the isotopic analyses, explains that his team are now using these techniques to track the habits of other animals. In particular, they have been tracking European starlings – an invasive species in North America that cause severe damage to food crops. ‘We’ve been using a multi-element approach to identify where young starlings immigrate from to damage crops, and they are what they eat – we’ve been able to basically determine where to concentrate those efforts to try to control them,’ says Curtis.